Iowa Workforce Development, in cooperation with community colleges, state universities, and private institutions (both for-profit and non-profit) including career/technical schools across the state of Iowa, conducts the Iowa College Student Survey. The survey is distributed to each postsecondary institution and then emailed to students by their administrative representatives. The purpose of the survey is to gather information regarding students’ intentions to either remain in Iowa or locate outside of Iowa following graduation or upon program completion. In addition, the survey asks students to rate what factors are most important to them when deciding where to locate and then provide their perception of Iowa when it comes to those same factors. Note: For optimal experience we recommend using the Google Chrome browser (download here). For assistance in navigating the Tableau visualization below, visit the Tableau Guide. Data from the 2017 survey can also be viewed and explored in the Tableau visualization below. 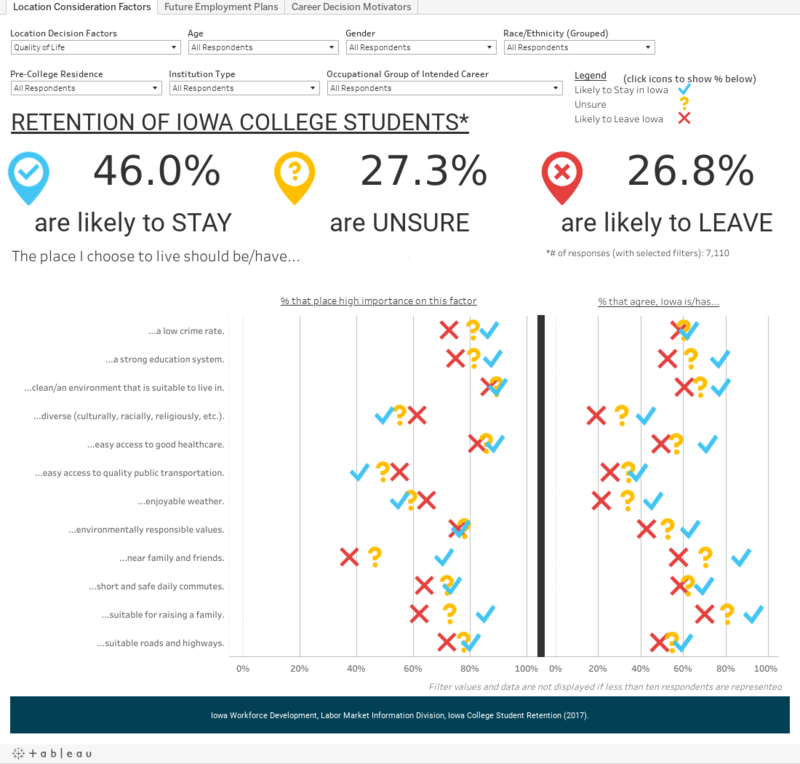 The percentage of students that responded they are likely to stay in Iowa, likely to leave, or are unsure is displayed in the first tab. The charts directly below show the percentage of those three groups that indicated various factors as being important to their decision-making process along with their opinion on how Iowa fairs relative to those factors. Use the Location Decision Factors drop-down to toggle which category of factors is displayed in the charts. The rest of the drop-down menus affect which demographic group data are displayed for. There are additional tabs at the top of the visualization click these to view and interact with different sets of data. The data is also available in CSV files. Click the button below to download the files.